Another thing to note is that especially for the basics of skiing, movements should be thought of as moving weight over a ski, not as pushing on a ski. 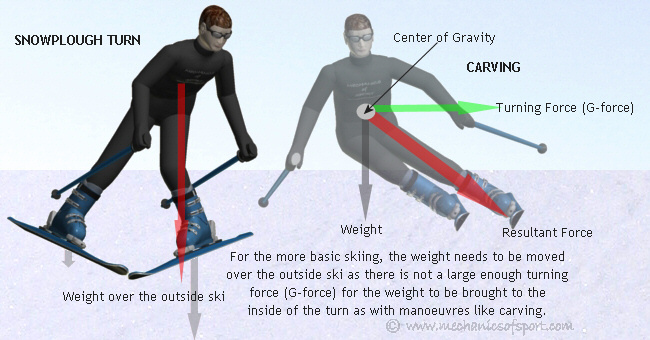 This is because in these more basic manoeuvres there is not enough speed or G-forces for the bodies centre of gravity to be taken away from over the skis. While the bodies weight is predominantly over the skis, the most control will be achieved from putting weight on the correct ski. Pushing on the skis is only used when the body is leant over enough that there could be a choice of which ski the weight could be transfered to with roughly the same outcome, i.e. when carving, or parallel turning at higher speeds. On to the Basic Mechanics Summary page.